Glycerol is changed into one of the intermediate products of glycolysis, so enters the cell respiration pathway. Fatty acids are changed in a series of reactions called beta-oxidation into acetyl CoA molecules, which enter cell metabolism at the Kreb's Cycle. NADH produced by glycolysis cannot cross the mitochondrial inner membrane and donate electrons directly to the electron transport chain because the inner membrane is impermeable to such large molecules. When O2 is not available and an alternative electron acceptor must be used. Pyruvate and NADH react to form lactate which is the anion of lactic acid. Carbo is Oxidized. It's oxidized state goes from 0+ to 4+ as electrons are removed by NAD+, which is then converted into NADP. The NADH generated by respiration is a good reducing agent but it is produced in too big of quantities for constructive purposes. 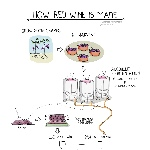 Red wine is made from the must (pulp) of red or black grapes and fermentation occurs together with the grape skins, which give the wine its color. White wine is made by fermenting juice which is made by pressing crushed grapes to extract a juice; the skins are removed and play no further role. Beer has 5.5% not because its yeast is more sensitive to the ethanol but because it is the legal limit. Fermentation must be stopped artificially usually by heating the beer to kill the yeast. Glycolysis:It provides 2 ATP molecules and 2 NADH + 2H+. Pyruvate Oxidation: It yields 2 NADH + 2H+ only. ETS: It produces 32 or 34 ATP molecules, and is the major source of energy for a cell.